Prices move up and down, and some analysts say they can’t explain why. But the reason for price moves is simple. When buyers are greedy, they push prices up. When sellers are fearful, they push prices down. Market price action is simply a battle of greed and fear. Because different investors have different time frames, the battle never ends, and prices are always on the move. Chart patterns paint a picture of this battle. Patterns show where to expect fear or greed to play an important role in the price action. A rare pattern shown in the chart below tells us where a stock market rally could run into trouble. This is a chart of the PowerShares QQQ Trust ETF (Nasdaq: QQQ), an exchange-traded fund, or ETF, that tracks the Nasdaq 100 Index. That index includes the largest tech stocks, including Facebook, Amazon and Apple. 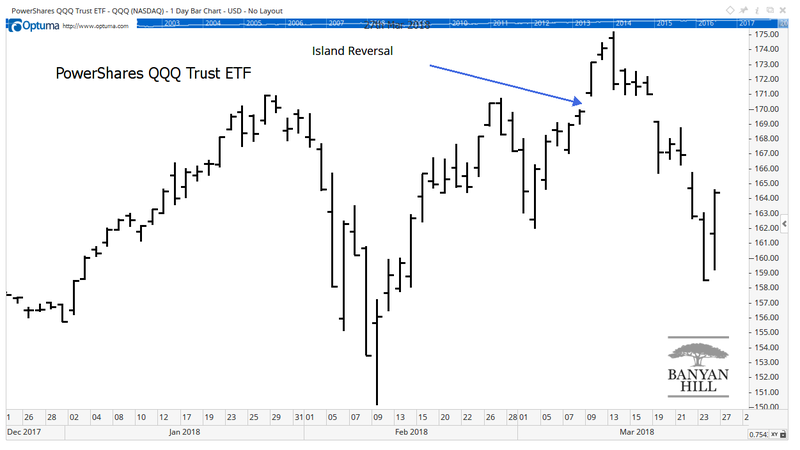 The chart pattern identified by the arrow, the island reversal, is important to watch. On March 9, traders couldn’t wait to buy stocks. They pushed prices up at the open, leaving an empty space on the chart known as a gap. This was bullish, and prices pushed higher the next day. On March 13, concerns about tariffs grew, and a sell-off pushed prices close to the low seen on March 9. The selling stopped right at the gap. Prices stayed close to that level for the next three days. Concern soon grew into fear. On March 19, traders couldn’t wait to sell. They created a gap down at the open. The pattern on the chart between the two gaps is an island reversal. Traders who bought between the gaps are trapped, metaphorically on an island, with losses. Many traders who bought those highs are hoping to break even. When prices come back to their buy level, they may sell. Other traders may think that pattern marks a high and be reluctant to buy there. This could slow any advance in the market. Island gaps are rare because the pattern requires a large emotional shift to generate the two gaps. The pattern shows greed suddenly turned to fear. Now we need to see if traders can overcome their fears and push QQQ to new highs. « Previous Did Everyone Give up on Driving Cars?